The last time I spoke to my dad, I hung up on him. I was asking to borrow money. I was 34 years old about to turn 35. I was terrified. I needed money. I had two baby girls. I had gone from $15 million to $0. Were they right? I don’t know. I don’t know anymore. I hung up on my dad. It was the last time I spoke with him. He was such an optimist he was stupid. There’s a tipping point where optimism goes from thinking to hoping. “Hope” is not a good strategy. When we played chess, he would attack and attack and attack. I finally learned to defend. Then he would lose. “What happened?”, he always asked. The attack was so strong. “Yes it was,” I said and I’d set up the pieces again. Everything is always going to get better! For him, for me, for the country. Everything that goes down, comes up again. Six months after I hung up on him, and refused all his messages, he had a stroke. For two years, he was frozen. I think he was in a “locked in” state. Where the mind is awake but the body can’t move. I’m thinking of this today because I am interviewing Garry Kasparov, the former World Chess Champion later. When I was 16 my dad and I would go over each game of Kasparov’s first World Championship win. Kasparov was 21 then. We all grow up. I loved those moments with my dad. Going over every move. The thrill! The field of battle! Being with my dad. 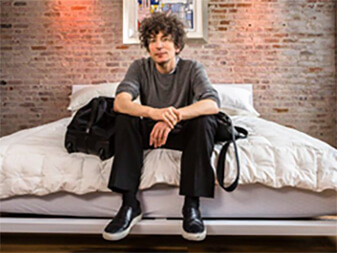 When he was in the locked in state and all he could do was stare at the ceiling, I blew up a chess problem (“white to move and win”) into poster-size and taped it to his ceiling. And another one to his door so he would see it whenever he was wheeled out. But I don’t know if he ever saw. I thought I saw his mouth move a tiny bit once but the doctors said it was just a reflex. They put him on a protocol (“brain dead but alive”). We all take shortcuts to make decisions easier. It’s easier for doctors to do that than to spend tens of thousands of dollars trying to figure out what was really happening. And probably most of the time they are right. Why should they listen to me? But I did think I saw his mouth move, his eyes flicker. I hung up on him. He called back but I didn’t pick up. And when he sent emails throughout the next six months I never responded. My sister asked me, “Do you feel bad?”, about a year into his waking up from the coma. I looked out the train window. I didn’t feel bad. I didn’t feel anything. I was a kid and I wanted to learn. Don’t ask for anything. And don’t show them your solution in advance. Ask them their problems, brainstorm on a solution until they say, “Yes, that’s it!” and then show how you have the solution already. My dad went dead broke when I was 18. He lost everything in a business he had started. He became so depressed he would cry all the time. Even in the middle of parent-teacher conferences or the grocery store. He used to be so confident. I went home from college once to cheer him up. We played chess and he was crying, “What’s wrong with me?” he said. He never got better. He had his stroke in an argument with someone who wasn’t paying him. Money: the pursuit of it, the loss of it, trying to regain it, being too optimistic about it, being screwed over repeatedly by people he trusted, this defined his life, destroyed his life, depressed his life, killed him. Or maybe me hanging up on him did. “Do you feel bad?” as my sister said. Or, “You killed him,” as my mother once wrote me but I think it was her sorrow that wrote it. I’m 14 years old. Even now. We always carry with us the person we were when that awful switch turned on: turning the sandbox of childhood to the wilderness of adulthood. At 14 I had severe acne and cysts, braces, too-tangled hair, glasses, no girl would talk to me, every big kid would punch me as hard as they could whenever they got the chance. And when I look in the mirror, I see my 14 year old self. But I didn’t have that confidence. I was beaten regularly at school. I wanted to die. My dad traveling all the time for work so I never saw him. Working to build his business that went broke. “Next month it will be better,” whenever I asked him about it. Always next month. Never now. Always optimistic for the future. Things don’t cycle back. He went into his stroke and for two years it only got worse for him. Bed sores, being dropped by nurses, the flu, eventual heart attack, and death. He lied. Sometimes it never cycles back. I’ve been scared ever since. Sometimes it doesn’t cycle back. Optimism is a myth. But today I’m interviewing my childhood hero for my podcast. 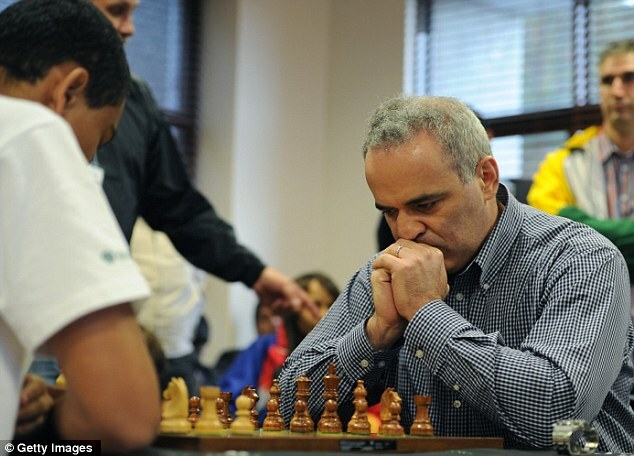 Garry Kasparov. My dad and I would spend hours looking over each game. So many years ago but I could feel the pieces in my hands right this very second, remembering as we analyzed all the possibilities. And tomorrow I don’t know. I’ll do something I love. I don’t need optimism. I need to love this moment and not hang up on it. Not give up on this moment. Because my dad taught me this: I loved him. Old vs. new. 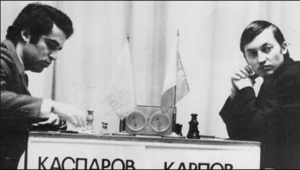 Kasparov the young dissident fighter vs. Karpov, the old “Soviet” regime, in 1985.